Volleyball is a game played in many nations. It is an international sport and also is represented in the Olympics. Volleyball is played in schools, colleges to professional teams. It is a game with 6 players on each side. There would be more players on the team and will be used as per the need. 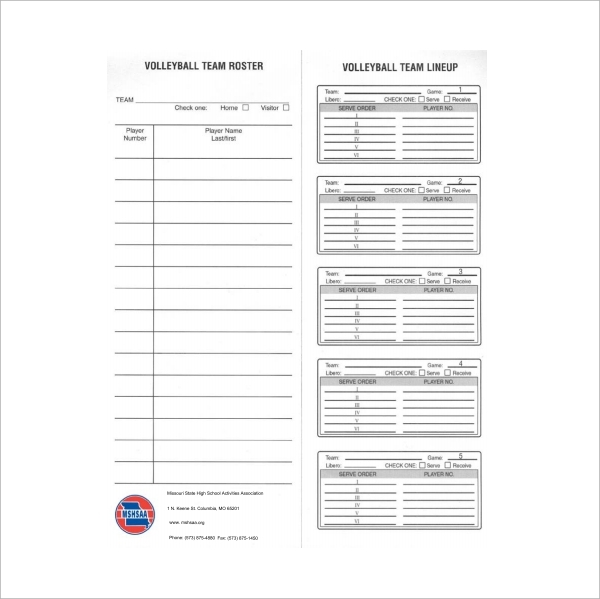 The volleyball roster is a document which has the details of the players and also the game they have played. The roster helps to keep the record of the games played by the team members. You may also like football roster templates. 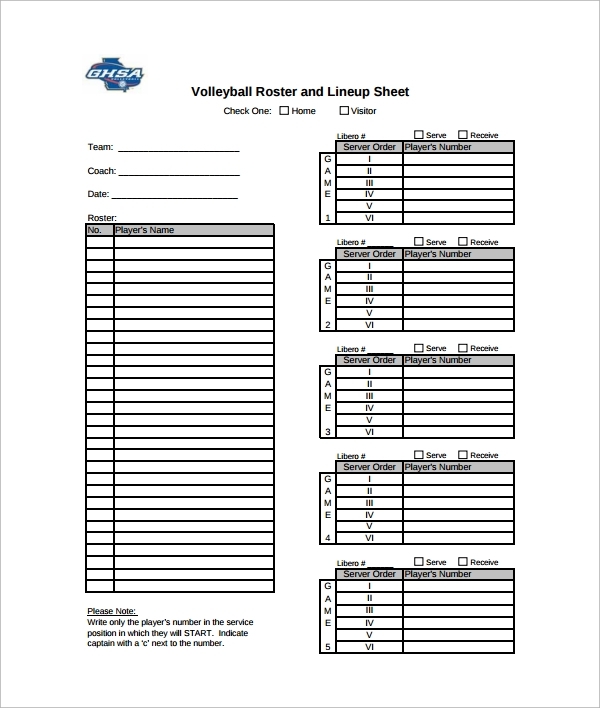 A volleyball roster template can be download from the internet for free. This would have been developed by certain people who have experience in volleyball. 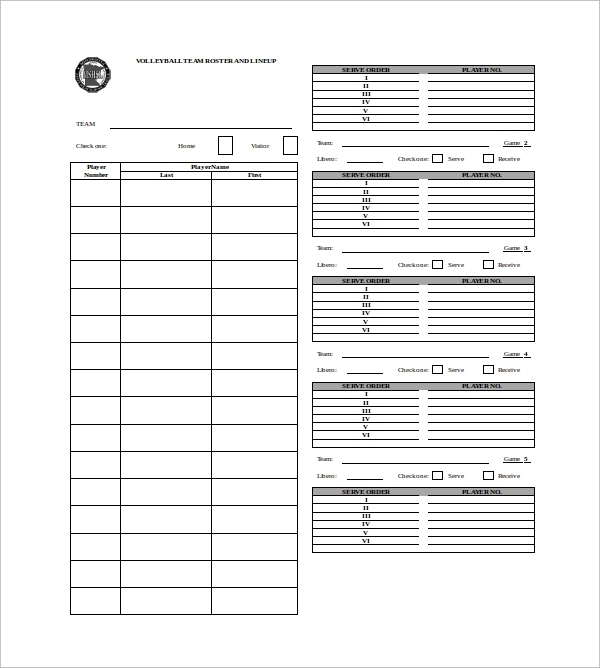 This free template can be used for creating the roster for a team of players playing in a tournament.You may also see soccer team roster templates. 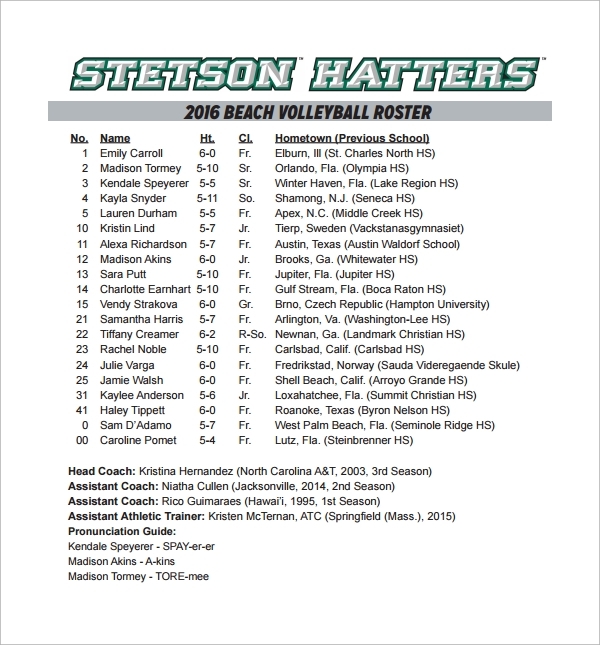 The volley roster is used to keep the list of players who plays volleyball in a team. It includes in what position they play and their positions like right side hitter or setter and the other various positions. 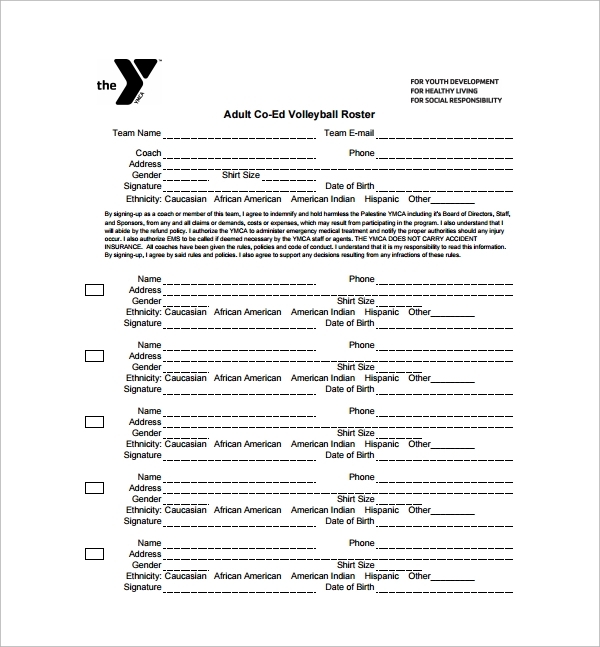 Based on an offensive or defensive strategy the coach can compose a team based on the volleyball roster and also have the volleyball lineup roster ready. 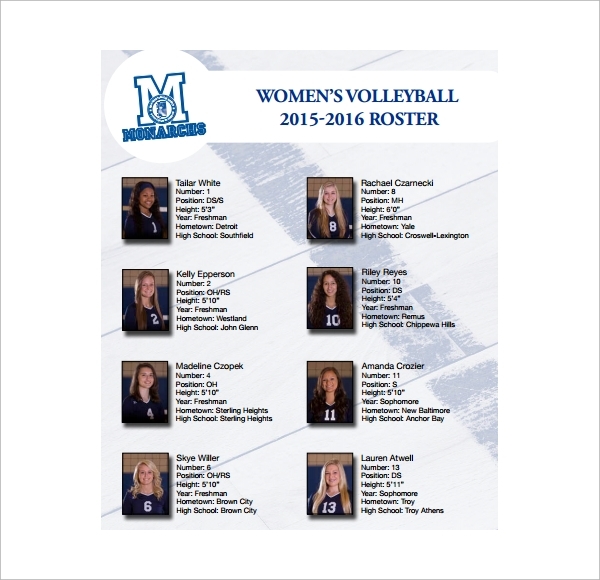 The roster is made available on web sites so that people can view the details of the players of the team. This is especially helpful for league volleyball games. You may also like sports roster templates. 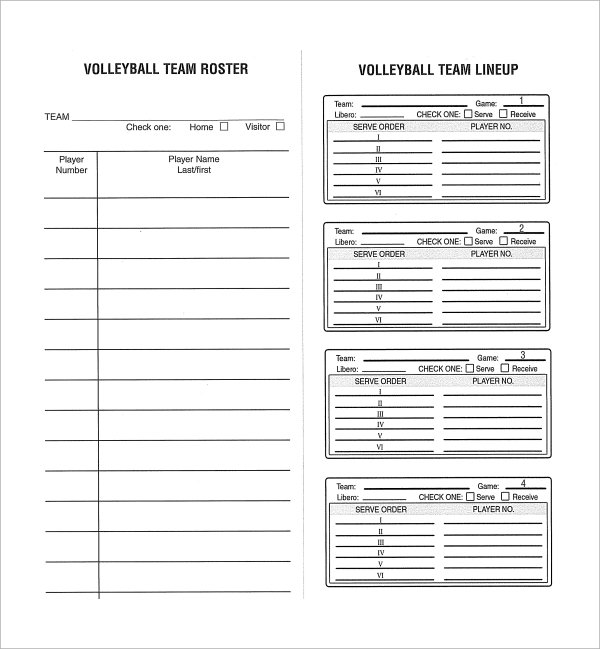 One can find different types of volleyball roster templates on the internet. You can download that and then customize the same for your perusal. In case you would like to create the template yourself it should consist of the name of the team and then go on to list the name of all the players. It should have the age of the player, the year he started playing the game and what position he plays. It should contain the physical characteristics like his height and weight. It is good to have a photograph of the person. It can have multiple fields like the birth place, which team he has played and averages of his performance One can have further information based on the purpose of the volleyball roster. You can create a different one for volleyball lineup. You may also like baseball roster templates.